VTUploader  is an application that integrates into the Explorer’s (right-click) contextual menu, listed under Send To> Total Virus . The application also makes it easy for submitting a URL or a program that is currently running in the OS. The service also offers an Android App  that employs the public API to search any installed application for VirusTotal’s previously scanned ones and its statuses. Any application not previously scanned may be submitted, but an API key must be provided and other restrictions to the public API may apply (see #Public API ). Files and URLs sent to the Internet will be shared with antivirus vendors and security companies. We do this because we believe it will eventually lead to safer Internet and better end-user protection. By default any file / URL submitted to VirusTotal which is detected by one of the scanners that do not detect the resource. Additionally, all files and URLs can be accessed by premiums (mainly security / antimalware companies / organizations) VirusTotal users. Jump up^ “Virustotal.com Traffic, Demographics and Competitors – Alexa” . Alexa Internet . Retrieved 20 October 2017 . Jump up^ Lardinois, Frederic. “Google Acquires Online Virus, Malware and VirusTotal URL Scanner” . TechCrunch . Retrieved 12 April 2013 . Jump up^ VirusTotal Team (7 September 2012). “An update from VirusTotal” . Blog.virustotal.com . Retrieved 3 June 2016 . Jump up^ “Credits & Acknowledgments: About VirusTotal” . VirusTotal . Retrieved 6 July 2014 . Jump up^ “Example Report” . 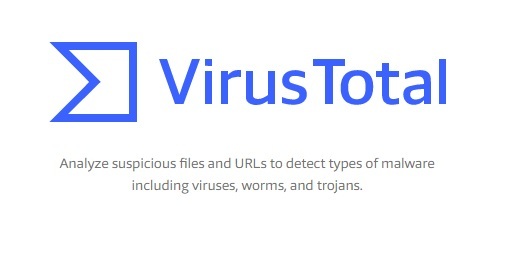 Virustotal.com. April 2, 2014 . Retrieved 3 June 2016. Jump up^ “About VirusTotal” . Virustotal.com . Retrieved 3 June 2016 . Jump up^ “VirusTotal gets a new hairdo” . VirusTotal Blog . Retrieved 4 November2017 . Jump up^ “Credits of VirusTotal” (in Spanish). Virustotal.com . Retrieved 3 June2016 . Jump up^ Dahl, Eric. “The 100 Best Products of 2007” . PCWorld . IDG Consumer & SMB . Retrieved 3 June 2016 . Jump up^ “VirusTotal Windows Desktop Application” . VirusTotal . Retrieved 16 February 2014 . Jump up^ “What is the maximum file size that can be submitted” . FAQ . VirusTotal. Retrieved 20 January 2015 . Jump up^ “VTzilla: Mozilla Firefox Browser Extension” . VirusTotal . Retrieved 23 March 2014 . Jump up^ “VirusTotal for Android” . VirusTotal . Retrieved 23 March 2014 . Jump up^ “VirusTotal Public API v2.0” . VirusTotal . Retrieved 23 March 2014 . ^ Jump up to:a b “Credits & Acknowledgments” . Virustotal . Virustotal . Retrieved 3 June 2016 .